Tuscany is very famous for its art, its nature, its good wine and its olive oil, but also for its charming and mysterious history. A number of castles and abbeys and many small country parishes remain to witness this glorious past. Civitella Marittima, the village of Casina di Rosa, is located on the border between the provinces of Siena and Grosseto and it is therefore the ideal starting point for exploring the many castles of this area. These sites are well worth a visit, because they are a testament to past times, when every small village was a lively and industrious centre. Civitella itself still has visible traces of its castle origins: it was in fact one of the castles of the Ardengheschi Counts. The names of some of the streets and squares are reminiscent of this past: Porta Conti (the Counts’ Gate), il Cassero (the donjon), Dietro le Mura (behind the walls), etc. Only one of the fortress’s gates has remained intact over the centuries, Porta Piccina (the Small Gate), from which it is possible to enjoy a breathtaking view over the valley between Civitella and Roccastrada. 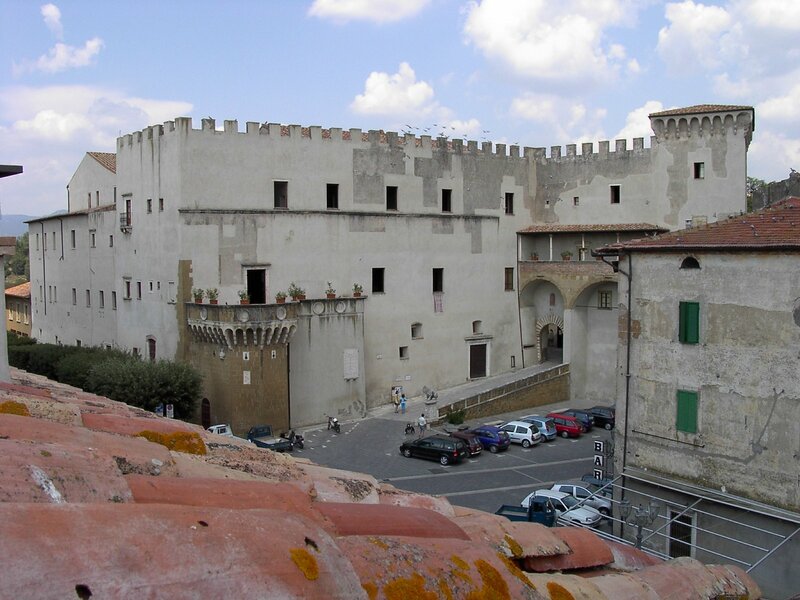 Here is a quick presentation of the many hamlets, castles and fortresses in the Upper Maremma and in other neighbouring areas of Tuscany that can be easily reached from Casina di Rosa. Paganico (6km) is a rare example of a fortified Sienese town. The city walls, with their towers, and three of the four gates are practically intact. The only gate missing is the gate that opened towards the river Ombrone. The village church is also of great interest: beautiful frescoes by Biagio di Goro Ghezzi and a very old wooden crucifix are preserved in the little church. In the Comune of Civitella Paganico, there are two other picturesque castles in a wonderful panoramic position: the Castle of Monte Antico and the Castle of Casenovole. Not far from Civitella Marittima, and clearly visible from the village, is the famous Castle of Poggio alle Mura, also known as Villa Banfi and home to one of the most popular producers of Brunello di Montalcino D.O.C.G. wine. The village is visible from the Castle itself. Roccastrada (13km) and its territory are rich in fortresses and castles overlooking the plains of the Maremma. Roccastrada itself has a fortress which dominates the village and from which, on clear days, it is possible to see the sea. 10km from Roccastrada, near the village of Sassofortino, trails in the woods allow the curious traveller to reach the ruins of a secluded castle. This is an ideal itinerary for those who want to enjoy a nice walk in the countryside. It is also possible to reach the castle by bike or on horseback. The castle of Montemassi is only few kilometres away from Sassofortino: for art lovers it is worth mentioning that this castle is portrayed in the famous fresco by Simone Martini in the Palazzo Pubblico in Siena. Also in the Maremma, castles worth a visit are: Castel Pietra in Gavorrano and, of course, the Fortezza Senese (Sienese Fortress) in Massa Marittima. Not far from Gavorrano we recommend a visit to the Castle of Scarlino also known as Rocca Pisana. Even the coastline of the Maremma boasts many beautiful castles. Castiglione della Pescaia has a still inhabited castle right in the old part of the town. Not far from the coastal town, the Castle at Rocchette provides a perfect excuse for a day trip to the beach in one of the most celebrated creeks of the whole region. More to the south, nature lovers should not miss a hiking day in the Maremma Nature Park where they can visit the Towers of the Parco dell’Uccellina. For food lovers, we recommend a visit to the town of Talamone, where you can visit the Rocca of Etruscan origins and then stop for lunch in one of the many seafood restaurants of the town. On the internal hills of the Maremma, halfway between Monte Amiata and the coast, Pitigliano and its Orsini Fortress represent the ideal destination for a rich day trip. On the same day, it is also possible to visit the nearby castles of Sorano, Rocca Orsini, and Castell’Ottieri and the Rocca Aldobrandesca in Sovana. The Rocca Silvana too is in this area. Travelling towards Mount Amiata, the castle lover should stop in Roccalbergna and admire its Fortress, also known as il Sasso (the rock). On the Grosseto side of Mount Amiata, Arcidosso has a perfectly preserved castle. The province of Siena is extremely rich in fortresses and castles: it boasts a huge number of them. On the Siena side of Mount Amiata, the Castle of Piancastagnaio is well worth a visit, and the same holds for the Castle of Fighine and for the Rocca in Radicofani. the Rocca Aldobrandesca in Castiglion d’Orcia: very picturesque and well preserved are the streets leading to the ruins of the castle. In the Crete Senesi, a perfectly preserved castle is the Castle of Grotti, near Ville di Corsano. The Castle of Grotti is located in the hills south of Siena, in a very panoramic position overlooking the Crete and the Val d’Orcia. The castle stands on the site of an ancient Etruscan settlement. It is first found mentioned in a document from 1221 as the birthplace of Orlandino di Azzo, a rich businessman of the 13th century. Later property of the noble Urgurgeri family, it was then conquered and destroyed by the Austro-Hispanic army during the last war against Siena and Montalcino, along with the other properties on the castle grounds and the near Strine Tower. The castle has an imposing U-shaped body, halfway between a stronghold and a tower. In the 19th century, it was used as a country residence by the Marquis Nerli before being bought by the Piccolomini family sometime in the last century. It now houses a foundation named after the painter Sergio Vacchi, which organizes exhibitions, concerts, plays and other relevant cultural events. The Castle is surrounded by a large garden, partly landscaped as a formal Italian garden and partly landscaped as an English country garden, a unique example in the whole region of Siena. The Castle is also located at the centre of a renowned agricultural estate that produces world-famous extra-virgin olive oil. The 16th century stables, with columns and vaulted ceiling, and the lemon-house are nowadays used as banquet halls for weddings and other events. The 19th century Villa Ballati, a building of great historical value, has been restored respecting all the original features of the property and is now a large vacation rental overlooking the garden of the castle. Just outside Siena, it is possible to admire the Castle of the Four Towers. Unfortunately it can be seen only from afar, because it is a private residence. Just a few kilometres away from Siena, the village of Monteriggioni provides lovers of the Middle Ages with the possibility to go back in time, at least in their imaginations, particularly during the popular medieval festival. If you want to spend an unforgettable holiday at Casina di Rosa and visit these beautiful medieval castles, visit our special offers page or contact us writing to info@casinadirosa.it. Photo banner by alessandraelle, Michele Zaimbri, mirkuz, rubix1138, Roby Ferrari, Kaspo, igullord, ghirolfo53, Paolo Sammicheli, jessica.